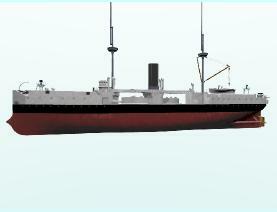 HMS Colossus 1882 - 1906 represents a major step forward in the design of battle ships in the 1880s. She was the first ship to mount 'modern' breech loading rifled guns - 12 inch rifled breech loaders (RBL) of 45 tons. She was the first major warship constructed in Britain with an all-steel hull - previous ships used significant amounts of iron, and she was the first to use compound armour for belt and turrets. Colossus, and her sister ship Edinburgh were also the last of the central citadel design of ship. In this site I am speculating about the way this ship could be fought. 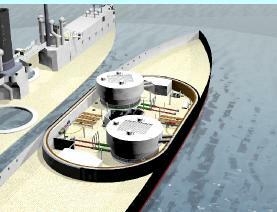 The structure of the ship has been modelled from plans from the National Maritime Museum. Using these drawings, and other references, I can present my view of how the guns were loaded, supplied and protected (and I don't pretend to be always correct!). The slow rate of fire, lack of range information, and relatively insensitive training mechanism dictated the very short combat ranges that dominated the naval strategists of the 1880s. Naval thinking expected battles to be fought at ranges of 1,000 to 2,000 yards - since it was practically impossible to hit a moving target beyond these ranges. So please wander through this web site. Currently, my animations are restricted to YouTube Flash movies (I am still developing my techniques) so if you cannot view them, my apologies - let me know what web browser you have and what movie viewer and I may eventually get it sorted. A word of warning, some movies are large, so be careful if you have a slow speed connection or a monthly download limit. In this site, some animations have a label ('Click Me', or 'Double-click me') to start the movie.